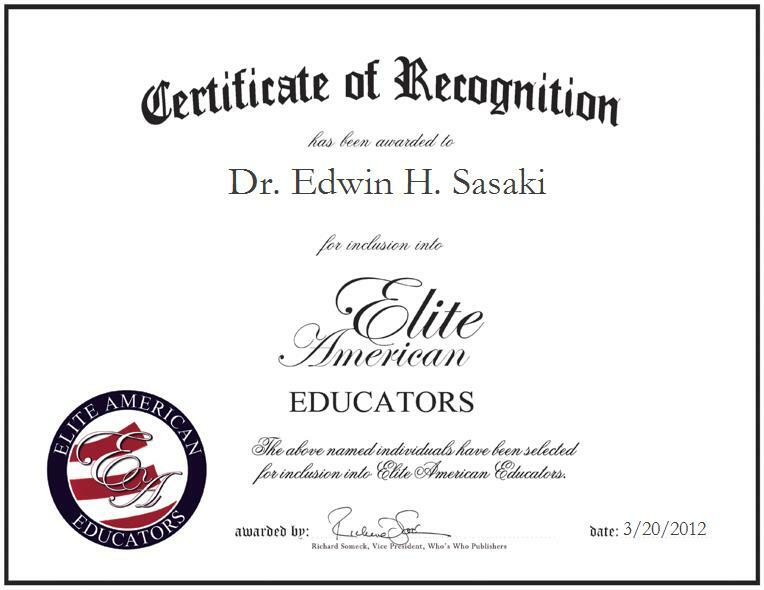 Dr. Edwin H. Sasaki is a FERP Professor of Psychology and Special Assistant to the Dean of the School of Social Sciences and Education at the School of Social Sciences and Education (SS&E) at California State University, Bakersfield. Dr. Sasaki was appointed as Assistant Professor of Psychology at California State University at Bakersfield in September 1972. He was promoted to Associate Professor, with tenure, in 1974, and promoted to Professor in 1978. He served as Chairman of the Psychology Department from 1973 to 1986. He also served as the Interim Chairman for the Biology Department in 1988 to 1989, Chairman of the Criminal Justice Department in 1989 to 1990 and as the Chairman for the Liberal Studies Program (academic preparation for elementary school teaching) in 1991 1992. He played significant roles in the establishment of the Master of Science in Psychology (1976), Bachelor of Arts in Child Development (1977), Bachelor of Arts in Criminal Justice (1978), and Master of Social Work (1996). He established the Institutional Review Board for Human Subjects Research and Institutional Animal Care & Use Committee in 1993 and 1996, respectively, to ensure that the university’s review and approval procedures were in full compliance with federal and state regulations. Dr. Sasaki’s management and administrative appointments include Interim School Dean for Arts & Sciences in 1986-1987 and again in 1990-1991, Associate Dean for Arts & Sciences 1987-1990 and again in 1991-1992, Dean for Graduate Studies & Research from 1992-1996, Interim “Founding” School Dean for Humanities & Social Sciences in 2000-2001, Interim Associate Vice President for Academic & Faculty Affairs and Dean for Undergraduate Studies from 2001-2004, Interim Associate Vice President for Academic Programs and Dean for Undergraduate & Graduate Studies from 2004-2006. He also served as the University Articulation Officer from 2001-2006 and as the Coordinator for Student Discipline & Judicial Affairs from 2001-2004. He served as the Director for the CSU Bakersfield “Planning for Change” Project during 1994-1996, which established the Faculty Teaching Learning & Teaching Center, Academic Advising & Information Center, annual professional development workshops for clerical & technical staff, and improved signage across campus. He also served as chairman of the CSU system-wide graduate deans in 1995-1996. 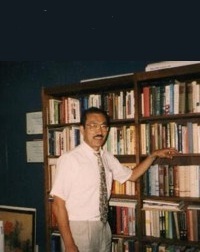 Dr. Sasaki established the Arts & Sciences Merit Award Scholarship Program in 1990-91 by raising $30,000 (in cooperation with the Arts & Sciences Community Advisory Committee) to award six $5,000 scholarships to the “best and brightest” students graduating from Bakersfield area high schools. This scholarship program continues to award the largest scholarships at CSU Bakersfield for incoming freshman students. He also established the Student Research Scholars Program in 1993-1994 by raising $12,000 (in cooperation with the CSU Bakersfield Foundation) to award six $2,000 research grants to undergraduate students sponsored by faculty. He also established the Travel Support for Student Research Program in 1994-1995 (in cooperation with the Associated Students, Inc.) to award up to $250 to each undergraduate or graduate student presenting papers at professional conferences. Dr. Sasaki was a member of a faculty team awarded the Undergraduate Research Participation grant by the National Science Foundation from 1975-1978 to annually support 12-15 undergraduate students conducting research under faculty sponsorship. He was also a member of a faculty team awarded the Student Science Training grant by NSF from 1976-1978 to annually support 18-20 “talented” high school students conducting research under faculty sponsorship. He has been heavily involved with pre-college (high school, junior high school, middle school and elementary school) academic preparation programs by serving as the principal investigator for the following grant projects: Pre-Collegiate Academic Development Program (2001-2003), Collaborative Academic Preparation Initiative Program (2001-2003), California Academic Preparation Program (2001-2006), Gaining Early Awareness & Readiness for Undergraduate Programs (2002-2006) and the CSU Early Assessment Program (2004-2006), which, for CSU Bakersfield, included the Reading Institute for Academic Preparation and the California Math Project. In 2002, Dr. Sasaki established the Combined Summer Academic Preparation Program which integrated programs offered by Student Affairs and Academic Affairs in “Summer Bridge” for new first-time freshman students. Two-week intensive “jump-start” programs in developmental English & Mathematics were added to CSAPP the following summer to assist students in making progress in these subject areas. In 2004-2005, Dr. Sasaki led a task force of energetic young faculty to develop the Roadrunner First-Year Resources for Undergraduate Success & High-Achievement Program. The Roadrunner First-Year RUSH-A Program was implemented during 2005-06 as an integrated three-component series of seminars-LEARN, ENGAGE, & SERVE-for all new students “in-transition” first-time freshman students and transfer or re-entry students. This first-year program now serves as the underpinning for the Foundations of Excellence collaboration between CSU Bakersfield and Bakersfield College, the primary 2-year community college “feeding” to the university, to conduct a joint self-study of the entire first-year experiences of students at the two institutions. Dr. Sasaki believes that the following characteristics separate him from many of his colleagues: willingness to “take a chance” by becoming involved with opportunities that have consistently occurred in his life; willingness to commit himself fully to ensure the success of these opportunities, including willingness to spend long hours, endure sleepless nights, engage in continuous traveling, and attend multiple meetings; willingness to “mentor the new” and to listen to the “sage advice of the old;” ability to develop a “realistic vision” of what could be and rally colleagues to share that vision and to commit to the realization of that vision; commitment to the “TORI” concept in working with colleagues: T = Trust (to be trusting of others and to be trustworthy of self); O = Openness (creating a communication climate so that everyone feels comfortable to share ideas, perceptions, values, criticisms, and suggestions); R = Realization (demonstrating “leadership” so that the shared vision will become a reality while individual goals are also realized) and I = Interdependence (making every person an active and contributing partner of the team). An abundant and successful career has allowed Dr. Sasaki to experience continued professional growth, while allowing others to learn and grow, as well. Although he has made countless contributions to his field, he feels that his greatest career achievements, thus far, Dr. Sasaki’s greatest career achievements thus far have been his experiences and contributions while on active duty with the U.S. Air Force between the years of 1962 and 1965. During this time, he conducted multiple research and evaluation projects about the effects of zero-gravity on human physiological “expenditure” and perceptual, perceptual-motor, psycho-motor, and gross-motor performance aboard C=131 and KC-135 flying parabolic trajectories to reproduce weightlessness. He also conducted zero-gravity evaluations of the EVA mission for Gemini 4, the prelude to Edward H. White’s first American “space walk” in June 1965 and of donning and doffing the “Phase B” Apollo pressure suit; these evaluations became the cover story for Aviation Week, for the 10th of February in 1964. He served as a member of the design team for the USAF Manned Orbiting Laboratory program, as a member of the design team for the AC-47 “Puff-the-Magic-Dragon” gunship and on the combat evaluation team for the gunship project in Vietnam, for which he flew 36 combat missions. He accumulated more than 1500 flying hours aboard B-47, AC-47, C-47, C-118, WC-121, C-130, C-131, KC-135, and UH-1B aircraft. He was awarded the following commendations and service medals: Air Medal, Air Force Commendation Medal, Presidential Unit Citation, Outstanding Air Force Unit Citation, Armed Forces Expeditionary Medal, and National Defense Service Medal. For all of his contributions to CSU Bakersfield in the past 34 years, President Horace Mitchell awarded him the Presidential Medal at the Humanities & Social Sciences Commencement in June 2006; this medal had been awarded to only three previous recipients.